Fleece season just got FABULOUS!!!! LOL. 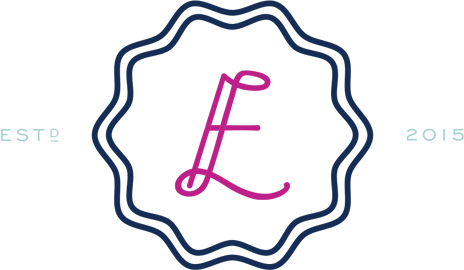 I am beyond excited to introduce you to my special Happily Eva After x Dudley Stephens fleece color: NEON PINK! I love this fleece so much I want to marry it. It’s been so hard to keep this a secret from you guys! 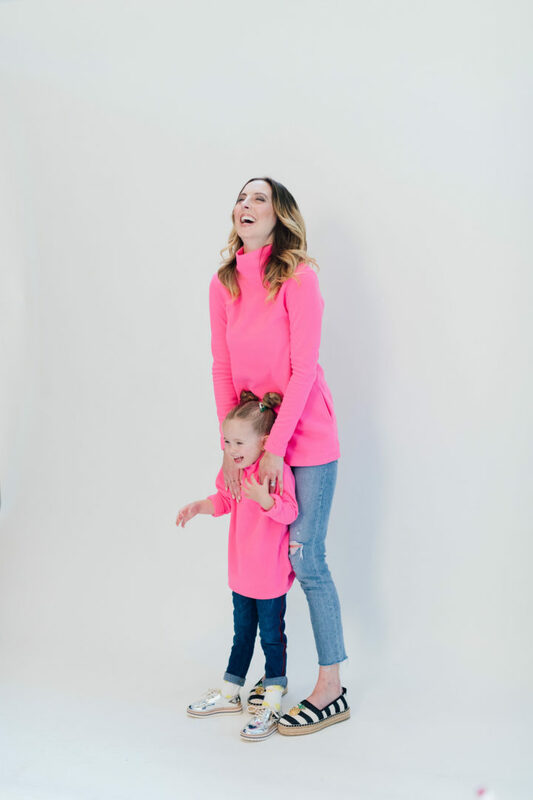 And the fact that I got to launch a girls’ fleece right alongside it, and make it a super special mother-daughter moment for Marlowe and I…well that is just as priceless as it gets. We have had such a blast participating in this fun collection. 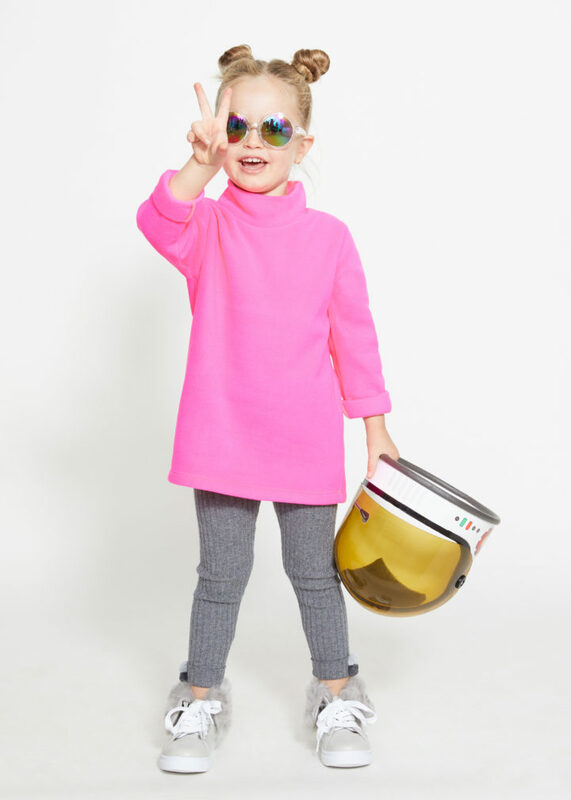 The Neon Pink color way comes in both the Cobble Hill and Park Slope styles, and in Girls sizes 2T-5T (The 2T fits one year old babies with the sleeves rolled up!) Oh, and as if you needed another reason to love these fleeces, the fleece itself is made with recycled plastic from bottles! Go ahead and save the planet, why don’t you? A note on sizing: I wear an XS, and I feel that the fleeces run pretty true to size. But check out the sizing guide on their site if you have questions! If you’re more petite or have a shorter torso I recommend the Park Slope style, since it is more of a classic length and not a tunic length. I am also super proud to say that the fleeces are size inclusive and go up to a size 20 (XXL)! I love the story behind my collab with Dudley Stephens almost as much as I love the fleece itself. Lauren Stephens and I are good friends (we are in a Momtrepreneur group together) and almost as soon as I tried her fleeces on and fell for them, I’ve been begging her for a neon pink version. I emailed her last winter one day while I was doing preschool drop off in my Cobble Hill, and I said “I NEED THIS FLEECE IN NEON PINK.” I’ve always felt that neon pink works as a neutral and can go with almost anything in really unexpected ways. It freshens up any outfit, and during the bleakest winter ever, I was needing that freshness! 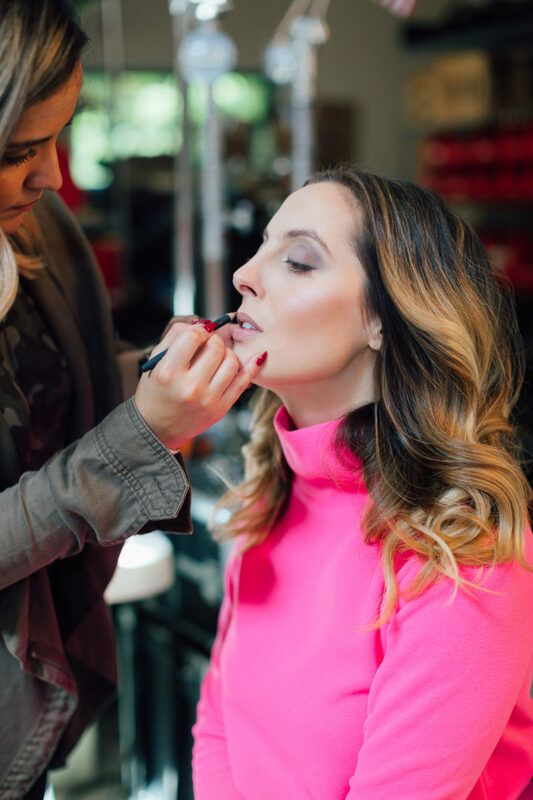 I was definitely that annoying friend for a couple of months every time she would tell us about a new Dudley Stephens color or product launch, and would follow it up with: “But when are we getting neon pink? !” One day I got a text from her with the neon pink fleece swatch of my dreams in her palm and it said “Let’s do it.” The rest is history! I’m so honored to be involved with this fleece color since I love Dudley Stephens as a brand so much as well. I always find myself drawn towards women and mom-run companies because I find that they discover the best ways to solve everyday design problems in a chic way. If you want to marry style with comfort, look no further than a Dudley Stephens fleece. You can be wearing workout clothes and throw one on top and you look instantly polished. I even wear mine out at night– it pairs perfectly with a cute skirt and booties, or a pair of leather leggings with some cool sneakers. I even wear it with tulle skirts or over maxi dresses to stay warmer! Because the fleece is so structured you can get away with almost anything! Well probably not murder, but you know what I’m saying. At least not in the neon pink colorway….bahahaha. When Marlowe and I got to finally see our fleece in person and shoot the campaign, it was the most exciting day. I was so happy to bring her around Lauren and Kaki (the sisters and Moms who founded DS Goods), and to show her how hard work can pay off to create something tangible that you can see, hold, and even wear! She couldn’t believe that the small piece of fabric turned in to a real thing! And that now lots of our friends all around the world can wear the same fleeces we put on in the morning! It’s blowing her mind, guys. LOL. I want to empower Marlowe always to know that if you can dream it, you can do it. Girl power all the way, baby! I was a little nervous about what it would be like to shoot the campaign with Lowie, though. She isn’t always the easiest during photo shoots, and she’s never done a “real” shoot before against a white backdrop with a flash and the whole shebang. There was a real possibility that she would just walk off set and go on strike. But the shoot was totally different than I feared! We laughed our heads off! She was in the goofiest mood, and to be honest, Marlowe is fully obsessed with Bonnie Dudley, Lauren and Kaki’s fabulously gorgeous Mama– and so she was basically just excited to be around her. I’ll take it! These campaign photos are something I will truly treasure for all my days, and I’ll always remember the laughs we shared. It makes the memory even more sweet that they were for an awesome collab with a great friend. I really hope you guys dig this color way as much as I do, and stay tuned for tons of ways to style it. I plan on living in mine all Fall and Winter long! Please leave your opinion on the neon pink Happily Eva After x Dudley Stephens fleeces in the comments below! 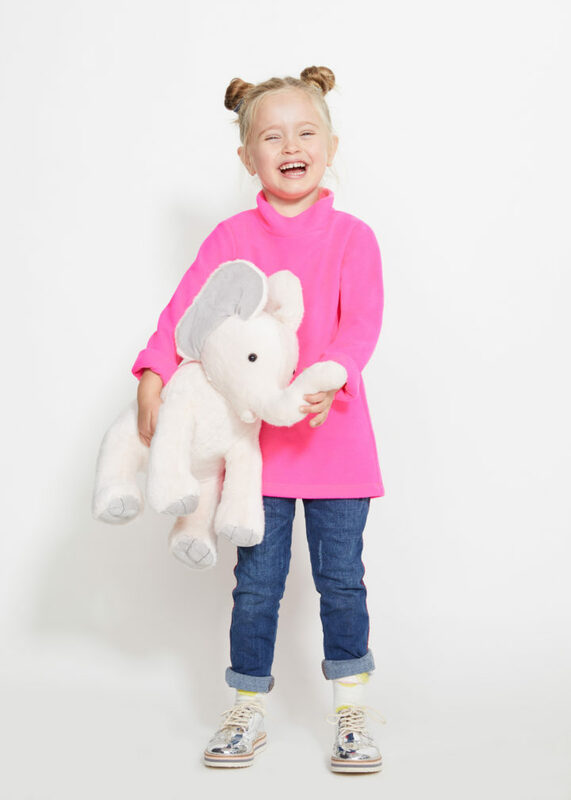 My blogger friend Julia is also launching her Ice Blue version of the Dudley Stephens fleece today, so make sure you check out her and her Mini Me as well! P.S.- Everyone who orders a Neon Pink Dudley Stephens Fleece will get a special little card in the package from Marlowe and me! BTS Photographs by Julia Dags. Campaign Photographs by Ryan Scherb. Hair and Makeup by Karla at Marsona Horan Salon. These are super cute and I love the sentiment but it seems insane to spend $160 on a fleece sweatshirt. I totally respect whatever people feel comfortable spending on clothes- however I will say that if you saw and felt one in person, and saw how well they wash and hold up and last forever- I wear mine almost every single day in the winter- it’s totally worth it!! Ooooh! Wow! Sold out already, although they still have it in girls! Congratulations.